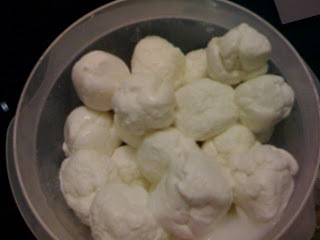 So, my buddy Sean twisted my arm and convinced me to start blogging my cheese making activities. Here we go! This photo show the results of my first attempt at making cheese, about two months ago. It's a 30-minute mozzarella, which of course took me more like 60 minutes. Nevertheless, it was quite tasty!